In December I was invited by the Lausanne tourism board to represent We Are Travel Girls and to discover the magic of the city during the Christmas period. I was surprised by how much the city has to offer and by how young and lively I found the atmosphere. From beautiful hotels and delicious restaurants to lovely Christmas lights installations and cultural activities, Lausanne is the perfect city to go for a weekend getaway on the run up for Christmas. We stayed at the Hôtel des Voyageurs which is located in the heart of Lausanne and is in short walking distance of all the places mentioned below. The hotel was renovated a couple of years ago and is very modern. The staff are very friendly and the prices are reasonable. 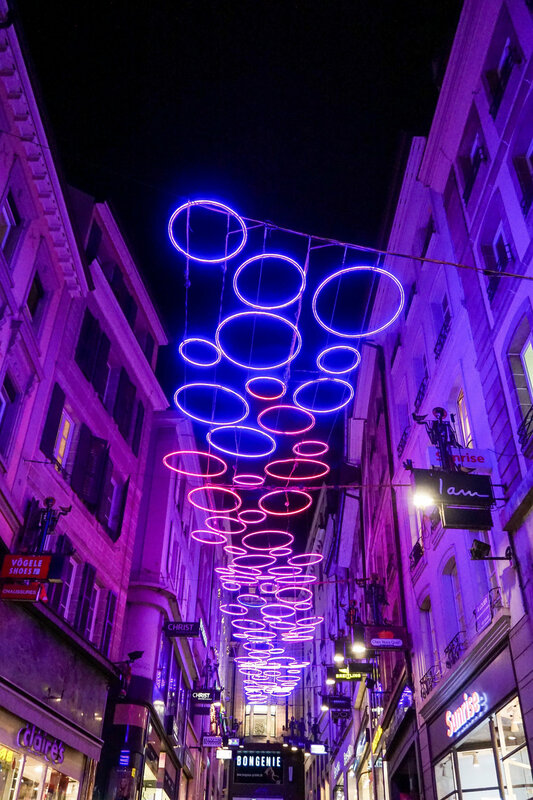 Lausanne is known for its amazing winter light installations from November to end of December. The city offers around fifteen different light installations around the streets of the old town which are all designed by different contemporary artists. When you hear of Switzerland, you automatically think of fondue, especially during the winter. If you’re not already familiar with this dish, it’s basically a pot of melted cheese served on a portable stove to keep the cheese liquid and make it easy for you to dip in your bread with a typical long-stemmed fondue fork. It's apparently bad luck in Switzerland if your piece of bread falls into the cheese pot so make sure you prick it properly with the fork! For the whole winter experience, head over to the temporary igloo set up on the place de l’Europe but do book a table in advance as it’s the place to be during the weeks before Christmas! Lausanne has different Christmas markets to please everyone – from markets dedicated to children, to markets selling local products from Switzerland, I’m sure you’ll find something for you or to offer as a Christmas present. The Cathedral of Notre Dame of Lausanne is a lovely church situated at the top of the city. You have a few stairs to get up to the top but trust me, the view is well worth it. It’s one of the best spots to see Lausanne as a whole with the Jura mountains in the background. We hit a snowstorm just as we got up and it was so magical to see all the snow covering the rooftops. You may not know this but Switzerland produces some lovely wine and has many different wine regions to boast. When you’re in Lausanne, you must go to the vineyards of Lavaux for a wine tasting. These vineyard terraces on the north shore of Lake Geneva are even UNESCO-listed! We went to the Domaine Croix Duplex and had a warm welcome by Maude as she explained the history behind her beautiful vineyards that her grandfather started back in the late 19th century and the particularities of the local grape variety named Chasselas. I find all cities and towns absolutely stunning when it snows so make sure you get out there before everyone else does in order to make the most of the fresh white snow. With the Christmas decorations in the background it’s the perfect fairytale winter wonderland setting. We all love to warm up with a nice glass of mulled wine in the winter. 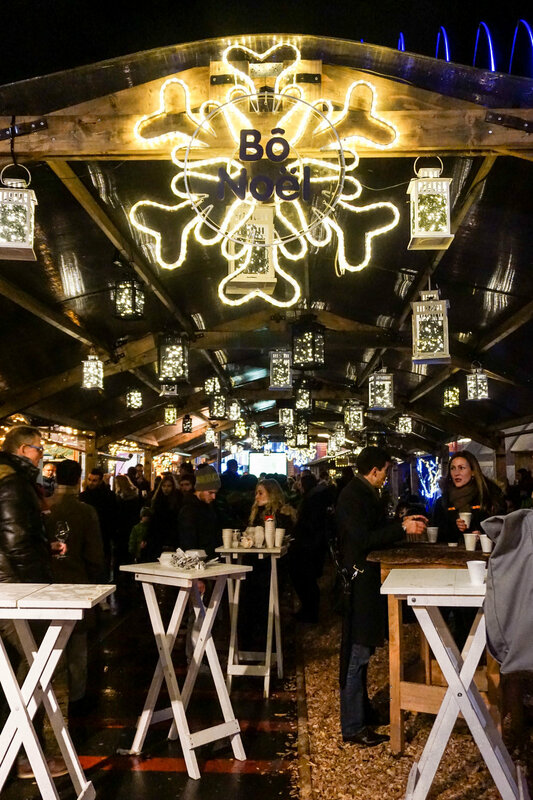 In Lausanne, there’s such a great ambiance and everyone gathers around the covered Christmas stands on the Place St-François to enjoy a glass or two of vin chaud. Plus they all use local wine so your guaranteed the best quality! Located in the centre of Lausanne, this small park is lovely to walk around and take nice pictures, especially when it’s covered in fresh snow. In the park you’ll find the Casino of Montbenon and the Palace of Justice. The park also offers wonderful views over Lake Léman. At night I suggest going to the Brasserie de Montbenon for dinner. It’s a really trendy and lively restaurant and the food is delicious. In addition to having the most lavish Christmas lights on the outside facade, the Lausanne Palace has a beautiful Habana Bar serving a variety of delicious cocktails – my personal recommendation is their Daiquiri. They also have a selection of quality cigars if you fancy a taste of Cuba. Does this post make you want to visit Lausanne next Christmas?